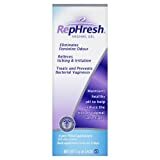 Order online – RepHresh Vaginal Gel, 4 Prefilled Applicators | Medical Supplies and Equipment. This product works wonderfully for women who have a problem controlling the natural balance of bacteria and as a result experience odor, discharge or irritation. One pack comes with 4 tampon-like gel filled applicators, each which lasts for 3 days (12 total days for a pack). If you wear tampons, applying the gel is just as easy– insert, deposit, remove plastic applicator. It totally calms down all the discomforts associated with bacterial imbalance. The problem is that after the application expires, somewhere around the 4th or 5th day all the symptoms will return unless you reapply the gel. Most drug stores sell them for between $16-19 (at least in my region) which can get pretty expensive considering that you’d need two boxes to make the whole month using them consistently. That can average from $33-$40 p/month for 24 calendar days. It would be wonderful if continual usage would improve the longterm vaginal pH over time but this product makes no such claims. So overall it’s great while you are using it but pricey with no longterm benefits.